Wild Turkey Hunting Decoys | The Decoy Sled - Bring your decoys to life! The Decoy Sled is made in the USA and designed by hunters with over 90 years of combined hunting experience. It is lightweight and deadly in the field – you will never want to be without it. 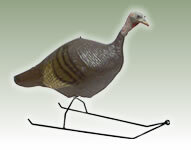 All kinds of decoys will work on The Decoy Sled, including turkeys, rabbits and a variety of small game. The patented design of this Wild Turkey hunting innovation is sure to give all your decoys life-like action. It can be used with a feeding decoy, or a regular decoy. Turkey hunters are amazed at how the Decoy Sled can "lure in" a Tom, avoiding frustrating "hang-ups" which can keep your target out of shooting range. Setup is a breeze and requires no tools. See a video of the Decoy Sled in action! Check back for upcoming shows or demonstrations. Proud owners of The Decoy Sled show off their Turkey hunting success! Enter The Wild Turkey Hunting Trophy Room! Also, check out these Turkey Hunting Testimonials.